RME | What Does RME Mean? 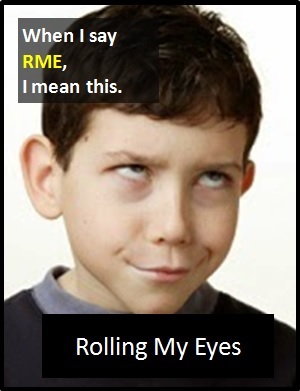 RME means "Rolling My Eyes". The abbreviation RME is used with the meaning "Rolling My Eyes". When used in direct response to a statement by another person, RME usually indicates good-natured scepticism or mock annoyance. However, when used to refer to the actions or statements of a third person, RME often indicates disbelief, exasperation or irritation. RME can be a good-natured jibe, or a sign of genuine irritation. Parent: Remember to call me as soon as you get there. Daughter: RME. It will be 4 o'clock in the morning. I will send you a message. Ted: Craig called in sick with the flu this morning. Sid: RME. Nothing to do with the fact the fight's on TV at lunchtime then? He is such a shirker! RME is an initialism abbreviation. Technically, this means it is pronounced using its individual letters (i.e., Ar Em Ee). However, it is not often uttered using its letters. The abbreviation RME is for efficiency in writing and not efficiency in speech. RME is typically used as a standalone declarative sentence (i.e., a statement). It is not normally used as another part of speech within a wider sentence. Before the digital era, we might have said something like "Here We Go Again" or "Yeah, Right" instead of using the abbreviation RME.